Duct work that was never properly sealed, has come loose or the tape has come off will significantly impact the customers heating bill, and place much extra wear & tear on their heating equipment. One of the most common ventilation services our company provides is Damaged Duct Replacement or Duct Repair in Vancouver Washington, Portland Oregon, and of course surrounding areas. Metal ventilation ducting can become rusted, oxidized, stepped on or crushed, damaged by animals or nesting, or come apart from poor craftsmanship. 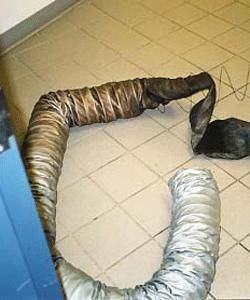 Flexible duct is very often animal damaged, cats living in it, rats, or lots of mice. They tear up the inner liner, which allows insulation particles to be carried into the homes breathable air. Water damage from flood, poor drainage, or plumbing issues is also a very common reason for needing ventilation service, duct repair or duct replacement. Water damage or any moisture introduced into the ventilation system will cause health issues due to rapid mold growth. Hot air from the furnace quickly creates bacteria & mold in wet duct work. Poor craftsmanship often results in ducting coming apart at the seams or lying on the ground under the house(which allows easier access for rodents & bugs) instead of strapped up neatly. Plastic or other incorrect venting materials used for Dryer vents can result in home fires, or at best, your clothes won’t dry as fast. Duct Replacement can improve your energy efficiency and reduce your carbon footprint. Often people don’t know the extent of their damage (and thus the severity of their need for duct replacement). A common phone call is “One or more of my heat registers in the floor is no longer blowing”. We have a minimum service charge to inspect the ductwork, which includes any minor duct repair, plus materials. 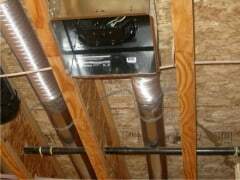 If we find that we do need to do a duct replacement, we treat the first call as a free bid. We work off simple flat rates. This includes all new materials, everything sealed with UL Listed Mastic Sealant up to current code and disposal of all old duct work. Damaged duct replacement is not something to ignore, here in the Great Northwest our high moisture levels speed up the mold & bacteria growth which the heating system quickly spreads throughout your home. Although we will replace the damaged duct work with galvanized metal heating duct if the customer requests it, typically our replacements are done with R8 flexible ducting. This product comes wrapped in R8 valued insulation, with a plastic Visqueen outer liner covering the raw insulation. The plastic inner liner keeps the insulation out of the breathable home air, and is formed in a spiral configuration improving air flow. Whenever we perform an inspection for Damaged Duct Replacement we want to make sure the problem doesn’t reoccur. If there was a plumbing issue that caused the damage, please let us know and verify that the issue has been remedied before we begin any work on your home. If animals were entering the crawl space of your home thru missing foundation vent screening, we can install new screening as part of our services. An increasingly popular ventilation service we provide is “Gaining Headroom”. Especially in Portland Oregon, over half of the homes have basements with exposed duct work. Often the basement is used only for storage or a cave like laundry room. Around 7 foot ceiling height is very common in this area. A 12″ round heating duct, especially if not strapped tightly to the ceiling, will make people have to duck to enter the space. Large duct systems can make the basement unusable! We just finished a project where we were able to re-route all of the duct work that hung low and crossed the entry ways and centers of the rooms to flat duct or along existing beams, freeing up 1000sq ft of our customers home. Another recent project had a 14″ round duct that ran right down the center of a room with 7 foot ceilings. We converted the round duct to 2 inch wide rectangular duct , gaining 12 inches of headroom, and our customer turned it into a billiards room with a nice pool table. Removing or changing interior walls often requires the duct work to be relocated. Kitchen renovations very often require a floor vent be moved. Adding a sliding glass door to a new patio often requires a floor vent to be moved. A large piece of furniture like an Armoire would be another reason to relocate a floor grill. Just closing the vents makes the equipment work extra hard and hastens premature failure. Adding ductwork: We frequently get called in to handle a variety of ductwork jobs from new bathroom remodels to heat runs for bedroom additions. Improper Dryer vent routing or poor craftsmanship on the original installation can often times be the cause of slow dry times. Having your dryer duct cleaned by our Air Duct Cleaning crews is a good first step to determining the real issue before spending money on a new clothes Dryer. If there are minor repairs that need to be made, most often our Air Duct Cleaning crew can take care of it on the spot. For larger dryer duct repairs in your home, our crew can assess the damage and get you a quote before any work is begun. Non commercial grade duct tape will fail, causing joints to come apart under your home. Dryer lint can build up in the crawl space, providing homes for rodents and other pests along with creating a potential fire hazard. Dryer duct repair is a common service we provide, offering commercial grade materials and very simple to understand affordable rates. For homeowners adding a new laundry location to your home, consulting with our trained Ventilation Technicians is a great starting point when determining the best route possible. I need my heating ducts repaired, shouldn’t I call an HVAC Company? For customers needing their heating ducts repaired or replaced, we’re your best bang for your buck! We do not install any actual furnaces or expensive equipment (although several of us are certified for furnace installation). Don’t pay a Furnace company to replace water damaged ducts if you don’t need a furnace. Since we don’t install furnace equipment, we don’t have to pay a technician to troubleshoot or warranty equipment. At my last job as a foreman of a fully mechanical company, we had one crew that averaged 40-60 hrs per week doing nothing but non-paying warranty & troubleshooting work. We would install a furnace, only to find out an internal part was bad. At J&M, our business plan was both unique & simple; Specialize so we can be the best, avoid overhead, purchase in bulk. This means for heating duct repair work or any of the great services we offer; you get the best highly trained specialized tech’s, your not paying our overhead for things you’ll never even see, and your getting top of the line materials at the lowest possible cost! So, when you need your heating ducts repaired or replaced, give us a call first. Call us no matter what your duct work needs are. We have the resources to get the job done.